The object of the driving mechanism is to increase (reduce) the accumulator content from a quantity equal to the digit set at the input device. Thirty years after Blaise Pascal has invented the pascaline, Leibniz (1646 - 1716) conceives a calculator that allows to perform the multiplication and the division in an easy way. The driving mechanism he has invented (the stepped drum) has been implemented in a lot of calculators until the birth of the electronic pocket calculators. Meanwhile the making of his machine was difficult at this period and the two calculators that have been constructed was unreliable and was never commercialised. The Leibniz calculator was the first who separates the enter of the data from the calculation, this allows to keep in memory as long as we wish the data to perform successive additions or subtractions and consequently to multiply or divide in a very simple manner. The mechanism consists of a cylinder wearing nine teeth of increasing length on his peripheral. The cylinder can be moved along his axis in such a way that for each full turn he engages 0 to 9 of his teeth with the gear of the accumulator. Leibniz is considered as the real precursor of the mechanical calculation. 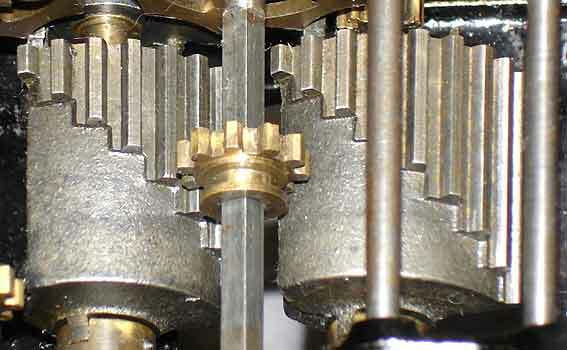 In the modern stepped drums calculators, instead of moving the cylinder along their axis, a gear moves along the cylinder in order to engage with more or less teeth (photo below). To see the movie of the stepped drums clic on the photo. In 1878, the swedish Willgodt Teophil Odhner (1845-1905) exhibits a cog wheel with retractable teeth (Odhner's wheel or pinwheel). the system is patented in Russia in 1878 and in Germany in 1891. In 1841, the french Didier Roth has made a pinwheel calculator, the two exemplaries he never finished (because he had become blind at the end of his life) are today in the CNAM museum in Paris. The Odhner's wheel has been adopted in a lot of calculators with lever or keyboard to enter the number. Three years before Odhner, in 1875 the American Frank Stephen Baldwin (1838 - 1925) had conceived a similar device. In the USA the pinwheel is called the Baldwin driving mecanism. We do not know if Odhner was aware of the Roth and Baldwin works. The picture below shows a pinwheel in position "3". To see an animation, clic on the picture. In 1911, Baldwin who works for the Monroe company reduces the size of the Leibniz cylinder by replacing it with two drums on the same axis. The first of these drums with 4 graduated teeth and the second with five teeth of identical length. The input of a digit lying between 1 and 4 operates on the first drum who shifts along his axis to engage with an intermediate gear (see the picture). For the digits 5 to 9, the second drum is also displaced. Clic on the picture to see a movie of the Monroe mechanism. A wheel toothed on the totality of its circumference can rotate of an angle proportional to the figure entered on the input device for each cycle of calculation. This system was developed by Christel Hamann (1870-1948) in 1925 and is implemented in calculators which bear its name and manufactured by Deutche Telefon Werke. This principle has been imagined by Leupold in 1727. Clic on the picture to see an animation of the Hamann mechanism. Another system is implemented in the mercedes calculators. It consists of 9 parallel toothed racks attached to a same lever H which is perpendicular to their direction.They are articulated on the lever at such distances of the rotation axis that, when the first one shifts of one tooth, the second shifts of 2, and so on. A figure entered to the input device engages a gear with the corresponding toothed rack (the digit 5 positions a gear on the toothed rack n° 5).When an addition is carried out, the lever H swivels around H ', and rocks in K to return to its starting position. During the return path, the accumulator dials are disengaged from the toothed racks. This principle had been used by Leupold in 1727, Grant en1871, Selling in 1886 and Christel Hamann in 1910 for the calculators Mercedes Euklid. Clic on the picture to see the toothed racks in action. Another type of driving mechanism gives increasing angular velocities to the numeral wheels of the accumulator. The wheel associated with a figure equal to 9 revolves 9 times more quickly than a wheel associated with figure 1. This technic was used in several Marchant calculators.